Preheat oven to 350 degrees. Cream together butter sugar and vanilla. Add crushed potato chips and pecans. Stir in flour. Batter will be dry. Form dough into small balls, using about 1 tsp. dough for each. Place on ungreased cookie sheet. Press balls flat with bottom of a tumbler dipped in sugar. Bake 16-18 minutes or until cookies are lightly browned. Makes 3.5 dozen. Ratatouille (pronounced rat-tat-too-e) is a traditional French Provençal stewed vegetable dish, originating in Nice. The full name of the dish is ratatouille Niçoise. The French “touiller” means to toss food. Ratatouille is usually served as a side dish, but also may be served as a meal on its own or accompanied by pasta, rice or bread. Tomatoes are a key ingredient, with garlic, onions, courgettes (zucchini), aubergine (eggplant), poivron (bell peppers), carrot, and bouquet garni or herbs like herbes de Provence. There is much debate on how to make a traditional ratatouille. My method is to simply sauté all of the vegetables together. Some cooks, including Julia Child, insist on a layering approach, where the aubergine and the courgettes are sautéed separately, while the tomatoes, onion, garlic and bell peppers are made into a sauce. The ratatouille is then layered in a casserole – aubergine, courgettes, tomato/pepper mixture – then baked in an oven. When ratatouille is used as a filling for savory crêpes or to fill an omelette, (last week’s recipe) the pieces are sometimes cut smaller. Also, unnecessary moisture is reduced by straining the liquid with a colander into a bowl, reducing it in a hot pan, then adding one or two tablespoons of reduced liquid back into the vegetables. the eggplant and brown. Add the peppers, the zucchinis, and the tomatoes with the bouquet garni let them cook for at least 35 minutes…. Stir often. You can eat it hot or cold. You are the chef. If you eat it with a roasted leg of lamb, and a Rose wine from Provence, you won’t be far from smelling the fragrances of the old flower market in Nice. Preheat oven to 400 degrees. 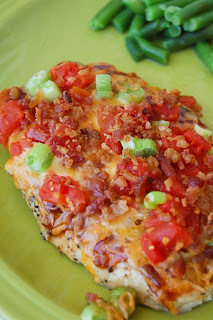 Pound out chicken breasts to flatten. Season with pepper. Grill chicken until no long pink (we used our George Foreman grill) and place on baking sheet covered with foil. 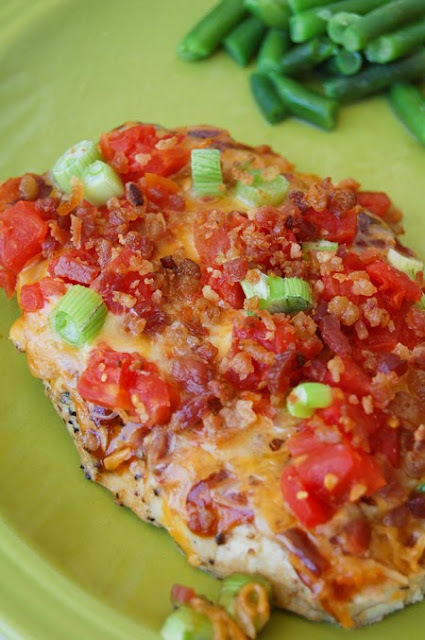 Top each chicken breast with one tablespoon bar-b-que sauce, 1/4 c. cheese, 1/4 c. tomatoes, green onions and one tablespoon of bacon bits. Place in oven and bake until cheese is melted (about 5 minutes). 1/2-1 cup chocolate chips, nuts, etc. Smash bananas in a large bowl (I just mixed them in my KitchenAid), then add remaining ingredients and mix well. Batter will fill 2 small loaf pans (GREAT for gifts!!) or one large loaf pan. Make sure to spray pans well with nonstick cooking spray and a little bit of flour.